Who’s Fighting Whom — And WITH Whom — In Syria? 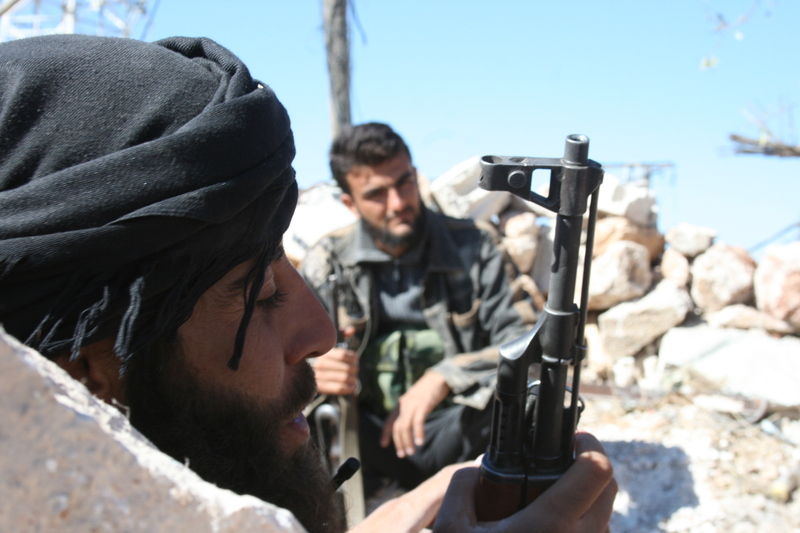 Al Nusrah fighters in Areha in October. David Axe photo. For at least the third time in three months, there has been a major shake-up in the command structure of the rebel brigades opposing the regime of Syrian Pres. Bashar Al Assad. An already confusing conflict has grown even more perplexing to outsiders. Worse, the divisions and alliances among fighters on the front line seem to diverge from the declarations made by those fighters’ own commanders, only deepening the confusion. The inability of foreign governments led by the U.S. to make sense of Syria’s opposition forces has resulted in Western countries mostly sitting out the conflict — to the great frustration of some rebel leaders. The Syrian opposition rose up in March 2011 when Al Assad’s troops opened fire on peaceful demonstrators demanding government reforms. Thousands of army officers quit the regime and joined everyday people in forming ad hoc rebel brigades that fought back against government troops. In November 2012 the main rebel fighters and their civilian backers met in Turkey to formally declare the opposition Syrian National Congress and its armed wing, the Free Syrian Army, soon to reach a peak strength of 200,000 fighters. The SNC and FSA control much of northern, southern and eastern Syria, with the regime maintaining control of the Syrian heartland in the west. In retrospect, late 2012 was the high point of the rebellion’s coherence and strength. By the spring of 2013, militant Islamist rebels, many of them foreigners, gained strength. In addition to battling the regime, the militants launched a campaign of kidnapping and assassination that has resulted in the abductions of hundreds of journalists and humanitarians and the deaths of many others. The first major schism within the opposition occurred in September, when two Al Qaeda-linked extremist rebel groups — Al Nusrah and the Islamic State of Iraq and Al Sham, a.k.a. “ISIS” — declared war on the FSA and followed up their declaration with an attack on the mainline rebel fighters in the northern border town of Azaz. Just a little over a week later, in late September, the rebel brigade Ahfad Al Rasool joined 12 other rebel units — many of them former members of the FSA — in forming a new military alliance backed by Saudi Arabia and Qatar and separate from the FSA. In its announcement, the new Army of Islam alliance specifically rejected the leadership of the U.S.-backed SNC. But that was a apparently a fig leaf, as the Army of Islam was reportedly meant to draw a line between Islamic Syrian opposition fighters and the foreign rebels of the militant Al Nusrah and ISIS groups. The formation of the new alliance “could be a preparatory step — a pragmatic consolidation that precedes any sort of direct confrontation with ISIS,” the Washington, D.C. Institute for the Study of War proposed. Sure enough, in late October the Army of Islam moved to rejoin, and indeed largely take charge of, the weakened FSA and SNC. There were conflicting reports regarding Washington’s view of this change. Some said the U.S. favors a revamped opposition with greater Saudi involvement; other have portrayed America as the big loser in the reshuffle, as its influence over the Syrian rebels diminishes. But all this high-level maneuvering seemed to have less direct effect on the ground than has been implied by the heated media coverage. After Al Nusrah’s split from the FSA and before the Army of Islam rejoined the main rebel group possibly in order to confront the Islamists, Al Nusrah’s militant fighters in the northern battleground town of Areha were still taking orders from an colonel of the Sham Falcons brigade, a core member of the FSA. So what’s really going on with Syria’s rebels? Who’s really in charge? Who’s actually fighting whom? This entry was posted in David Axe, English, Syria.